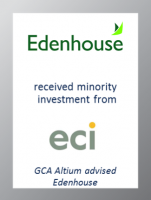 GCA Altium acted as exclusive financial adviser to Edenhouse, the UK’s largest independent SAP specialist, on securing a minority investment by ECI Partners. Edenhouse is a highly differentiated SAP “one-stop-shop” providing the full range of SAP consulting, support and implementation services across the entire portfolio of SAP products. Edenhouse has over 250 highly skilled, permanent onshore consultants serving around 300 enterprise customers, as well as a growing SME customer base, across multiple industry verticals. Edenhouse’s flexible and versatile support-led model is growing rapidly and generates market-leading utilisation rates, a high level of recurring revenues and strong cash generation. Edenhouse was founded in 2008 by members of the current management team. The Edenhouse management team will continue to manage and grow the business with the financial and strategic support of ECI Partners. “GCA Altium were first class. Their experience and detailed knowledge of our sector enabled us to deliver the right result for all stakeholders – and in ECI, we have found the ideal partner to take our business forward,” commented Paul Solomon, the CEO of Edenhouse. This latest transaction sees GCA build on its leading position as an international technology sector adviser, having completed over 20 transactions in this sector over the past six months.